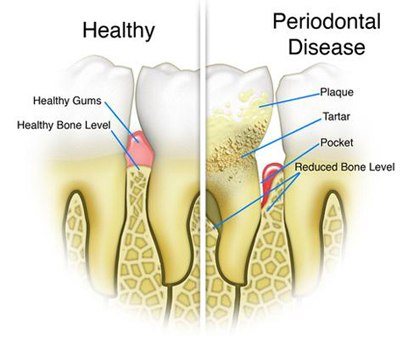 Gum disease is a bacterial infection also called periodontal disease. There is now strong evidence that the toxins released by the gum cells in response to the bacteria can get into the bloodstream and affect many parts of the body. While everyone has bacteria in their mouths, not everyone develops gum disease. There are identifiable risk factors that can make it more likely for the bacteria in your mouth to result in destructive gum disease. We now know that due to these risk factors some patients, no matter how much they clean their teeth and visit the dentist regularly, they still have gum problems. Over time, food and bacteria tend to collect between the teeth and gum. If this debris is not sufficiently removed, the bacteria migrate deeper under the gum line. In a susceptible patient, a space or "pocket" forms between the tooth and gum. Once these pockets of bacteria form below the gum line you cannot reach them, even with good tooth brushing and flossing. The bacteria multiply and cause the gum cells to release a variety of substances that aggravate and inflame the gum tissues. First the gum tissue and then the supporting bone are slowly destroyed. If enough bone tissue is destroyed, the teeth loosen and are eventually lost. Gum disease rarely causes pain or any symptoms as the infection readily drains up through the gum. Often you can't tell if you even have gum disease until the gum is checked for pockets. Just because it doesn't hurt doesn't mean all is well. We don't need to wait until damage has been done to tell if you have gum disease. Through careful monitoring we can detect gum disease early and prevent or repair its damage. You can keep watch also. Bleeding is a strong indicator of gum inflammation. Healthy gums do not bleed at all when brushed or flossed. If you have any gum bleeding when you clean your teeth, your gums are inflamed. It has become apparent in recent years that this bacterial infection in your mouth can have far reaching effects elsewhere in your body. When the gums are chronically inflamed, these bacteria can enter your bloodstream and spread to other parts of your body. Gum disease increases your risk of heart disease. Gum disease has also been linked to pulmonary infections and gastric ulcer re-infection. Gum disease in diabetics makes control of blood sugar more difficult. Gum disease during pregnancy increases the risk for a pre-term, low birth weight baby. The progression of gum disease can be halted if the bacteria and debris are removed from these pockets. Traditionally, gum disease treatment consisted of cutting the diseased gum away with the hope that what would remain would heal and be healthy. Fortunately, a variety of new techniques have allowed us to treat chronic gum infections successfully using much more conservative and minimally invasive procedures to help you achieve and then maintain a preferred level of oral health. If you have any questions about periodontal infection treatment or other dental problems, please don't hesitate to call us on 01252 812008.